The village seemed a bit quiet as she looked around, she dug her nails into her palms and moved forward "Lets just hope that the traitor didn't do anything..." she stated not liking how quiet it was, she still feared that Yomi had gotten to the villages before her, though Sesshoumaru had put him in a rather roughed up state so she only hoped things were different. "They must be further into the village..."
Sayuri looked at them as she would move to the center of the large group, she had to be carefull with her words....without the villagers behind her it would be almost impossible to retake her home. She turned towards the Elder, she knew that Yomi had been a great part to their survival....to their longevity of it all even now as she took a deep breath hearing the whispers and would speak. "Lord Sesshoumaru is indeed injured and lays resting as we speak..." the whispers began to grow louder as her eyes opened and they could see the burning aura within her, she looked at the elder fully then to the others. "But it was Yomi who attacked us...." again the whispers continued to grow, saying that she was not speaking the truth and that Yomi would do nothing like that. She knew if she just flat out told them everything about what Yomi had really done, to get the isles under his control they wouldn't believe her. "I ask you....I know Yomi is a warrior of strength....but I am a Ren....and for centuries before my families death who protected you?....you gave you homes?......who accepted you when the other lands tossed you out because of one reason or another?" she asked looking them over, the isles had over the centuries become the homes of exiles, banishment, those seeking a place of acceptance....anything that tied them to the chaotic nature of 'life' brought them here. "I seek to bring these isles to heel once more, to once again allow you to call it your home.....who will you choose to aid you? The man who kept you hidden in barriers....locked away from the world? forgotten? or myself who seeks to let you once again reclaim the lives you lost the day those flames took it all from us?....." Sayuri knew he was right, she couldn't give up this fight she was the lady of these lands she needed to learn to quell the questions. "Where is he now then?" she asked simply as she stood there, "I stand before you now allowing you to ask these questions to me....yet he hides? he does not wish to face me openly in this?" she looked at them all. "He has done much for you, for me in the past as well....but I could have remained in the west, abandoning you to forever live forgotten.....but I came here to free you all of this torment. I do not build that palace in hopes for the past to return....I build it for us. I build a city for you all to call home, to trade, to grow....I will be building a school very soon that is open to any who wish to become scholars or even able to wield magic as openly as any youkai wield their own abilities.....I forge a new path." The whispers still continued as she looked around them, "I give you this choice.....stand with me and help me build your home for your children and their children. 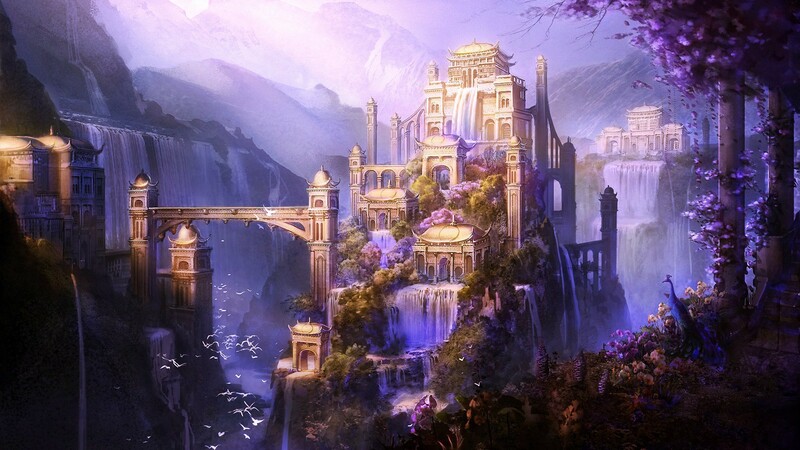 Or remain here.....hidden and forgotten forever afraid of what lays outside that barrier"
Sayuri nodded her head as she stood there, "I thank you for this trust Elder, if you all wish to relocate the palace is open. I've a new idea for a royal city I hope you all will take to it." she stated then turned to Magi, "let us head to the next village, as soon as we leave here I've no doubt that word will spread of what I said here." "It seems rumors spread like wildfire among island folk"Magi said as he nodded his head and began walking with her again "I must say, I think you handled that quite well. I've seen lesser men lose their nerve under far less scrunity. You definitely seem to have the knack for leadership"he commented as they pressed on "So, tell me about this royal city you speak of. Is this in addition to the academy?" "I was thinking that the underground palace would become the royal city, that it would connect the port to the palace. I then figured we would build the academy as well and have that be another connecting point. Each village will be its own, allowing those that wish to remain in them but still connected with that option but the main hub will be beneath the palace itself.....keeping the isles natural forests and mountains for farming and gathering of the rare herbs....of course we will have to minimize how much 'digging' happens just so we do not compromise anything." she stated thinking over things, there was a bit of a 'mountain' range that if one looked on a map was the tail end of the one that lead towards the south and was the starting point of the divide between the two lands but it didn't start getting truly taller till one got closer to the dividing line. "Or we could use the mountain line.....it leads back towards the west and we could have a main port there as well.."
Sayuri would glance over towards Magi as she would smile a bit at him, sometimes she wondered if another specially Sesshoumaru knew or even liked what her mind thought of. However, she was finding a new 'love' towards the older man who was teaching her the art of magic. It was further causing her mind to expand and think of new ideas that just continued to come to her. "Thank you...Magi, since coming here I have felt a new...surge of life within me...." she chuckled. "I'll begin the preparations on the city and the tower immediately....best get to work on those forbidden chambers Magi or I'll be kicking you out and solving them myself" she was of course teasing him. With that being said Sayuri would push for her new plans, the villages were already working together working on removing their barriers and also setting up new 'connections' her plan for the city to be within the mountain line was her main focus besides learning the chaos magic. She wanted the isles....to be her home, to be the villagers home and she was going to make it perfect. The villagers elders came to her showing her their own 'maps' showing where each village could 'connect' to the royal city that Sayuri. Though construction on the palace seemed to now be in reverse, she was having it moved if the Royal city was to be in the mountains so would the palace, a monument would be put in its place to 'honor' all those that had fallen more so her parents but..but also a marker to show the progress of the isles. Several months had already passed by that point as little work on what Kurama was planning but she wasn't going to worry about something that would damper her people's hopes for a new life. She stood on a small hill looking over the mountain range a small smirk on her lips as she twirled a sphere in the air as she was still ever growing her mana pool. "It's looking wonderful" she stated turning to the men and women who were helping plan the city, people who had once built the palace themselves. "How are the other villagers tunnels going?" "We are digging them out slowly now, that may take some time as we don't want to compromise the soil or the ground....but progress is going steady till then we will use the old roads" "Perfect..." she stated looking back at the mountain range again. "what about the academy?" "Lord Magi is overseeing that part, but its being constructed nearest the old palace.....to connect better to the catacombs....though he isn't allowing us furth..." "That is because only he is strong enough to hold off what ever is in there....till a better barrier is put in place you'll keep that in mind." "Yes milady...." the man stated. "A barrier will be placed over the 'top' allowing natural light to still pour in and fresh air to vent through with the royal palace at the center....it be like something out of a story" "That's what I want....these isles were hidden for so long, I do not wish to damage what nature has claimed but we still need to make a place for ourselves....so long as that is maintained these lands will prosper." In the months that had passed, Sesshoumaru had slowly been growing in strength. He could be up for limited amounts of times, and in order to restore faith in the villagers he would allow them visitation during those times and would recieve their thanks and solve any minor problems they have. In honest, Sesshoumaru had left the governing of the Isles and the Academy up to Sayuri and Magi. This was a world that they understood far better than he, and most of the time when they talked around him, Sesshoumaru feigned sleep or general disinterest. He was a fighter, not a mage, so he felt that Sayuri should be in charge of her homelands, even if he is just the face of the Western Palace. In the time that had passed, the Dragon Emperor, aware of the crimes brought up, had visited with Lord Raizen. That meeting did not go very well and with it began the start of Raizen’s Rebellion. Raizen and his oni decided to leave the Empire and waged war against the other 3 lands. However, being so far displaced, the Isles were enjoying the peace from their shrouded existence, however a young lord, itching to fight by his father’s side, was not. Sayuri knew he was agitated with having to stay here, he wanted to fight and not play politics of 'rebuild' anything. A soft sigh left her lips as she brushed some of her hair from her face, heading towards their chambers within part of the new palace. She raised her hand and pressed it against the door and would speak. "If your that bored why don't you ask your father to take part in his enforcement on his borders to the east?" she asked simply, she held in her other hand a few scrolls and tombs to read over. Magi still was training her even when she had plans to approve and speak with the elders. "Or we could go and train....so long as I get to use some of the new spells I learned...." even though he hated it when she used magic. "It's always new spells"Sesshoumaru said shaking his head as he pushed his hair over his shoulder "I can't exactly call it a fair fight if your magic prevents me from getting within striking distance of you. "he said with a slight sour tone in his voice as his gaze shifted back over to her "I've already had correspondence with my father. He does not believe I am well enough to aid him in the battles. He tells me my fight should be fighting to get back to perfect health. I can almost hear his laugh through the ink on the parchment. "he sighed "I am assuming you have more errands to run for Magi soon anyway. When do you anticipate all this construction is going to be over? It is hard to sleep when they are constantly coming in and rearranging or moving everything to the other palace." "I can't build my magic levels if I don't use the magic, I've explained this to you numerous times already Sesshoumaru" she said but wold move closer to him, she knew he was frustrated and was itching to do more than just sit around and wait for the next orders. "And the construction is near complete at the palace, at least the part we will be living in but you wont be able to hear anything. Also we found a natural hot spring so you can soak in a hot bath when ever.....and there will be a massive training yard so you can practice to your hearts content." she slid her arms around his shoulders and soon leaned down to kiss his forehead. "Just hold on for a bit longer for me..."
Sayuri would sigh some as she would see Magi walking in, and when he removed Sesshoumaru's clothing she would speak "You know if you just taught me what to look for you wouldn't sour his mood so much.....and removing his cloths that way isn't all that necessary" she stated trying to be on her husband side but when he brought up the academy her attention did change as she would smile. "That is wonderful! I'm sure there are several here within the villages that have the talent for magic, it would be fantastic if we could keep the talents local before branching out." she said simply but at the conversation of the tunnels she sighed, "they are taking a while....but with making sure we aren't damaging the land above and its safe, its rather difficult....I know magic could help however, magi you've been rather busy this whole time if you take students by the end of the weak you'd be to busy wouldn't you?" Sayuri sighed some watching all because he was bitten so long ago but she would sit down on the bed watching him dress her husbands wounds, then looked back at him. To get things done faster was the key, specially when trying to reestablish the isles and if they were done faster then her husband could get the rest he needed. Raising her hand she would rub her brows some, it was not easy to run a small 'country' so she wondered how her father-in-law did it but she would speak "do what you must...create the whole palace if it will get what we need done faster....and give Sesshoumaru the proper rest he needs so he can go out and...kill a few foxes and onis" she stated with a small smile towards him. Sayuri waited till Magi was gone and would then look back towards Sesshoumaru, "He's not horrible and he at least means well in some cases....I'll see what I can do to make the palace construction faster, I did set up a new study for you with a large balcony and a reading area so that you can at least stretch out for the days that you have to do paperwork...." she was trying to make this a bit more interesting for him, "or....we can go try out those hot springs"
"That's the excuse you always make for him"Sesshoumaru stated with a glare as he then sat up "I would like a bath before people start flooding the palace with their demands once more"he stated "The faster this academy is open, the sooner I feel like things might start feeling like normal around here. At least the mage will be busy again."